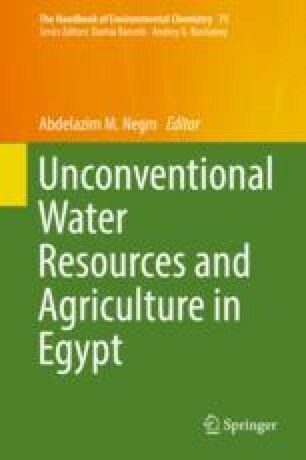 In Egypt, water sector suffers from scarcity and deterioration of water quality due to the disposal of untreated or partially treated municipal wastewater especially in rural areas. This problem makes developing new, appropriate, and affordable methods for municipal wastewater treatment of great concern. Among these methods are the constructed wetlands (CWLs). The technology consists mainly of vegetation, substrates, soils, microorganisms, and water. It utilizes complex processes involving physical, chemical, and biological mechanisms to remove various contaminants. The two major types of CWLs in use are, namely, free water surface (FWS) wetland and subsurface flow (SSF) wetland. The SSF is further classified according to the flow direction to horizontal or vertical. Also, hybrid system is used for better treatment performance and nitrogen removal. CWLs are characterized by easy operation, low capital costs and maintenance, robust process able to withstand a wide range of operating conditions, and a good landscape. This chapter highlighted and portrayed the CWL technology, understanding the different types, designs, and factors affecting their performance. Also, the mechanisms of removal of organic matters, total suspended solids, nutrients, heavy metals, and pathogens are portrayed and assessed. Factors affecting the performance of the different types of CWLs such as hydraulic loading rate (HLR), hydraulic retention time (HRT), and types of vegetation are also elaborated. The potential of using CWLs in Egypt for wastewater reuse according to the Egyptian code of standards for wastewater reuse and some successful case studied using CWLs for wastewater and drainage remediation are included.